View our complete image gallery. Full list not yet confirmed. 2013 Topps Opening Day Baseball isn't about the hits. It's not about finding the white whale of your collection -- unless it's an autograph from the Philly Phanatic, Mr. Met or Mariner Moose. Targeted at young collectors and those just looking for a fun, cheap break, 2013 Topps Opening Day has a straightforward base set and lots of inserts. While there are a few autographs, they're not the release's main focus. It's more of an old-fashioned experience for those not interested in high-end baseball cards. 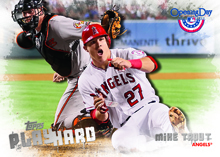 The 2013 Topps Opening Day Baseball base set has 220 cards. This includes 75 players who aren't in 2013 Topps Series 1 Baseball. The design is very similar to the flagship set, although it will be instantly recognizable with the Opening Day logo. Opening Day Edition parallels come with a blue border. They are also numbered to 2013. The entire base set has four different one-of-one Press Plates as well. Every pack includes one insert. Mascots return for another season with a 25-card set. Key moments from the 2012 season are captured in Superstar Celebration. Opening Day Stars is done in 3D. Play Hard showcases 25 players who show hustle and hard work on the field. Finally, Ballpark Fun is all about the excitement that can be found at the stadium. Although not a major part of the release, there are signatures to be found in 2013 Topps Opening Day Baseball. Opening Day Autographs has a ten-card checklist that includes David Wright and Hanley Ramirez. Other announced signers include Ike Davis, Boone Logan and Josh Vitters. 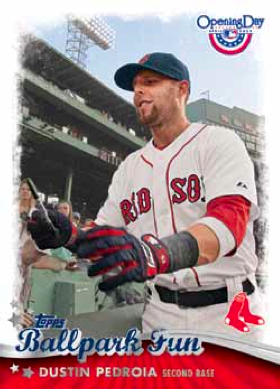 Several off-season transactions and post-season celebrations are featured on the base card variations. Perhaps the most intriguing aspect of the set are five Mascot Autographs. Yes, they're mascots. They don't hit home runs. The don't toss no-hitters. Heck, they are usually on the losing end of base races against three-year-old kids. For a lot of fans growing up, mascots are among the highlights of trips to the ballpark. Much like thousands of kids run around Disneyland everyday looking for signatures from Mickey Mouse and Donald Duck, these cards should be seen as something fun for young collectors (and the young-at-heart). Mascot Autographs come from the Philly Phanatic (Phillies), Mariner Moose (Mariners), Mr. Met, Fredbird (Cardinals), Mr. Met (Mets) and Rangers Captain (Rangers). 2013 Topps Opening Day Baseball boxes have 36 packs of seven cards. They should cost about a dollar a pack. Good: Nice mix of current players and rookies. Very solid checklist. Photos chosen are fantastic. Insert sets are unique and have a fun feel to them. Blue parallels really pop. Mascots inserts and autographs are a cool addition. Opening Day Stars 3D is a great set. Base variations are a nice surprise. Bad: Hits are virtually impossible to come across. No big-name autographs outside of David Wright and Hanley Ramirez. Autograph checklist only includes ten total players and feature stickers. No game-used cards. The Bottom Line: This release is geared to mainly towards kids and collectors on a budget. Topps does a good job showcasing cards aimed at that demographic while still including some chase options. The design and execution of this product is its best feature. Topps does a great job of including players in their new uniforms for a release that hit the shelves before the season started. 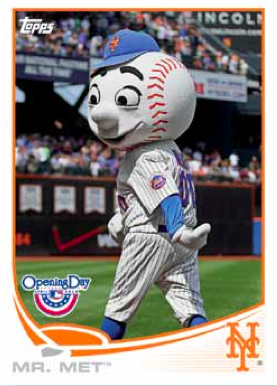 From Superstar Celebrations to Ballpark Fun to Mascots, 2013 Topps Opening Day has a fun feel to it all around and really brings out the kid in you. The 3D inserts are awesome. 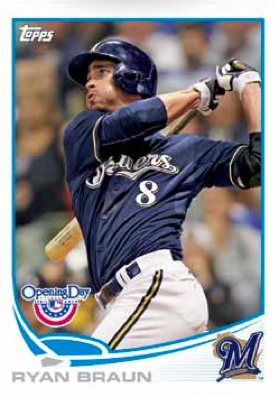 2013 Topps Opening Day has a solid variety of current players to go along with most of the high-profile rookies available for an early release. The insert sets feature several superstars in each set. The Mascots set includes most of the teams, which is a nice addition. The base set has a full parallel that is numbered out of 2013, with a vibrant blue foil border. There is also a base purple-border parallel found exclusively in Toys R Us packs. Topps has done a nice job of expanding the checklist of Opening Day over the years to make it fairly similar to the flagship Topps release for a much lower price. Given the price point on this product, expectations should be realistic. There is always the outside chance to pull an autograph, but they are rare. Likewise, base variations have proven to have good value but only fall about 1:617 packs. With around six per box, blue-border parallels add a realistic chase component. The photos combined with the insert sets make for a great overall product. If you are looking for a fun and low-cost box to complete a set and enjoy the experience of breaking a box, this product is a grand slam. Always wondered if this set is really necessary. Kent Ritchie � It’s aimed primarily at the retail market. Some see the low price a great way to introduce new collectors to the hobby. This set is great cause of my 9 y/o daughter. Cheap enough for her to collect and such. I’d love to have a Mariner Moose auto! It is excellent! 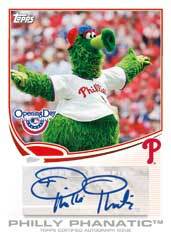 I’m just surprised that Topps didn’t do all Mascots as autographs as well. Got one from a blaster box from Target. It’s Fredbird. I like Opening day for it’s easy to get a complete set and the price is a great one. Hopefully we can get more collectors in the hobby. I have a 5 year old son who is on the brink of beginning to really dive into sports. This is an inexpensive way for him to save and buy some packs or even a box and introduce himself to the players in a way he can recognize. I feel a lot better if he doesn’t exactly take the greatest care of a box we got for 30 bucks rather than a 80 dollar box. Plus, if we pull something cool like a plate, I can always exercise the Dad Tax! As someone looking to memorize some stats and have some nostalgic fun, this set is perfect for me. I like the price and the time spent organizing by team, by position, and keeping up with my knowledge of the sport. And I second wanting a Mariner Moose autograph! Low Cost, fun for me and my 8yo son. Pulled a David Wright autograph in our first 3 packs. Good times! I bought one hobby box and got 209 of the 220 base set cards. There were no doubles in the box. (6) blue border cards, (8) superstar celebrations, (7) Ballpark Fun, (7) 3D Cards, (7) Play Hard, (7) Mascots, No Autos or Plates. Not sure if it’s normal to not get doubles. The only issue I have with these cards are the fact that they look exactly like the 2013 topps cards expect for the opening day logo printed on the front. I have seen both hobby and retail boxes for sale. But I’m not sure how different they are. I have yet to see the odds of pulling auots or plates hobby vs retail compared. I would hope I could at least complete the base set with another box then again you never know. I love this set b/c I pulled the Prince Fielder “Glory Hole” Card in GEM MINT CONDITION!!!! Who would think a card w/ a hole in the middle could be so sought after, so rare, valuable coming from a pack that costs $.99!!!! Prob. the only time I will ever say this but Topps did a good job on this one!!!!!! Michael Smith, rating a product 5 / 5 stars just because you got a lucky pull, is just as absurd as someone rating a 1 / 5 stars just because they happened to get a crappy pack. Opening Day is not a 5 star product. The 2013 Opening Day was a decent year for a mediocre to low-end product. Rating a 4, because the price-point was right on, and as others have mentioned, is a great set for kids.